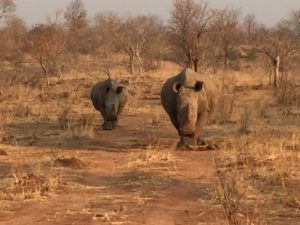 While rhino and leopard sightings can be rare on safari, finding lions, elephants, and buffaloes are usually quite easy. Indeed, finding the Big Five is almost guaranteed and shouldn’t be a major concern when choosing a safari outfitter. Far more important is the expertise and communication skills of your guide, level of comfort at your lodges, the number of other land rovers surrounding that lone leopard in the tree, and the opportunity to meet locals and feel part of the African community. With a population of only 2.3 million people, Botswana offers one of Africa’s least populated wilderness experiences. 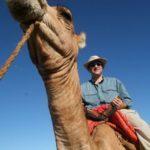 The country’s enviable conservation philosophy endorses low-volume, high-revenue tourism, and significant benefits for local communities who live amongst the wild animals. 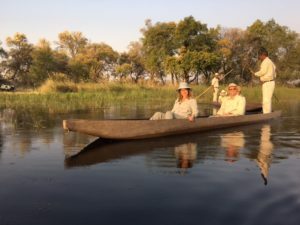 Unlike Kenya’s Maasai Mara or Tanzania’s Ngorongoro Crater, which can often be overcrowded, in the Okavango Delta you’re not likely to see any fellow travelers out on game drives or boat rides. On our first two days of safari at Stanley’s Camp, we passed one other vehicle. Botswana was my 5th safari and by far the most diverse when it comes to terrain. Much of the trip revolved around water, which was a welcome relief to often jarring game drives on rutted roads. At the recently refurbished Chief’s Camp, we would take our first of many jaunts on the waterways, this time via a mokoro, a traditional form of canoe. A guide poled us through the tall grasses on a leisurely paddle during sunset, Botswana’s version of a gondola ride. 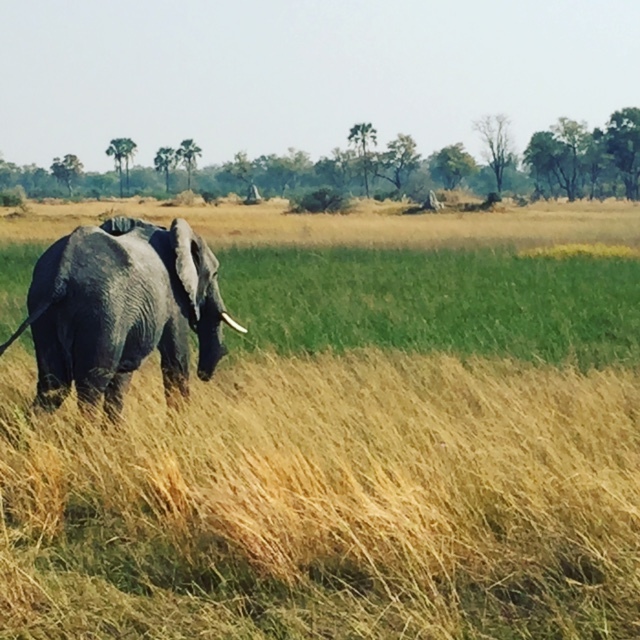 The abundance of wildlife at Chobe National Park, our third stop, was mind-blowing. Best known for the largest population of elephants in the world, over 75,000, you would peer out and see long parades of elephants, including countless babies. The magical boat ride on the Chobe River, which borders Botswana and Namibia, was so much fun, we asked to go on it two sunsets in a row. 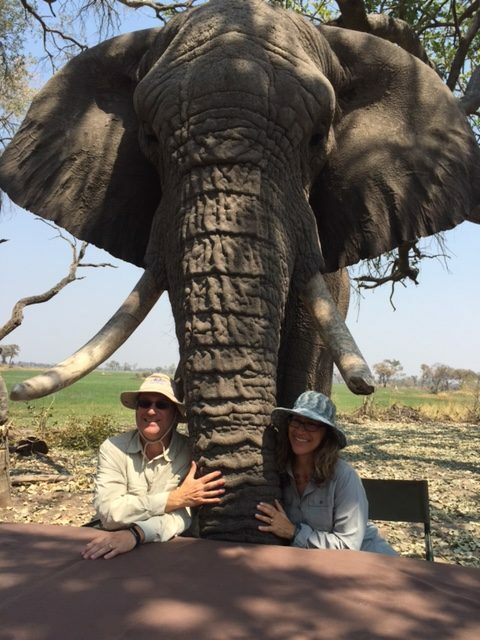 We watched as elephants swam across the deep river, joined by large herds of Cape Buffalo, crocodiles as still as sculpture, and all types of antelope. Leaving Botswana, we stopped on the Zimbabwe side of Victoria Falls to watch the waters of the Zambezi River plunge down one of the widest waterfalls in the world, over a mile long. 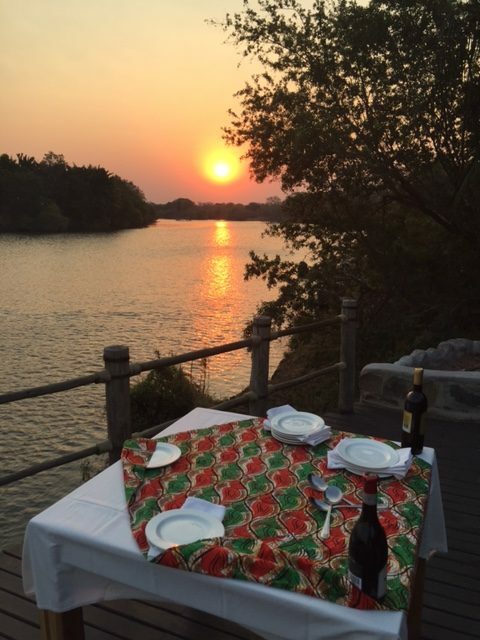 Then it was on to our last stop, Sanctuary Sussi & Chuma, overlooking the Zambezi on the outskirts of Livingstone, Zambia. We would spend our final day canoeing the river near hippos, warthogs, crocs, and impala. We stayed at 4 different Sanctuary Lodges in Botswana and Zambia, all with a distinct feel of their own and all perfectly situated in a pristine chunk of wilderness. Our first lodge, Stanley’s, felt remote, lost in the Okavango Delta. I loved dining under the stars and then sitting around the campfire afterwards. Chief’s Camp in the Moremi Game Reserve deserves all the accolades it’s receiving, like a recent mention in London’s Sunday Times calling it the “the most luxurious safari camp in Africa.” Rooms are spacious and ultra-sybaritic, with plunge pools, outdoor showers, and a huge deck to watch the baboons and elephants at the nearby watering hole. Chobe Chilwero overlooks the Chobe River and Namibia on the opposite shores. We savored the moment when we returned from a cruise on the river to find a luxurious bubble bath waiting for us. Sussi & Chuma felt entirely authentic, especially after having lunch at the over-the-top Colonial outpost, the Victorian Fall Hotel. Built on an elevated walkway, all rooms overlook Zambia’s Zambezi River. One experience I won’t soon forget is downing a strong vodka tonic, thanks to my favorite bartender, Vincent, on the deck overlooking the river at sunset. A campfire was roaring, the reddish-pink sun was reflecting off the waters, and hippos were grunting in the background. On our last day of the trip, we visited the community of Nakatindi not far from where we stayed at Sussi & Chuma in Livingstone, Zambia. When the government promised this village a medical clinic, fresh water, and a primary school and never came through on that promise, Abercrombie and Kent came to the forefront. They built a clinic that now serves 10,000 people annually. They were also instrumental in educating the community about Malaria and AIDS, the two killers that have left many children in this village as orphans. When the villagers had to walk through a national park to get their water from the Zambezi River, they were frequently attacked by wildlife. So Abercrombie and Kent created a water pump to get fresh water piped to their village directly. 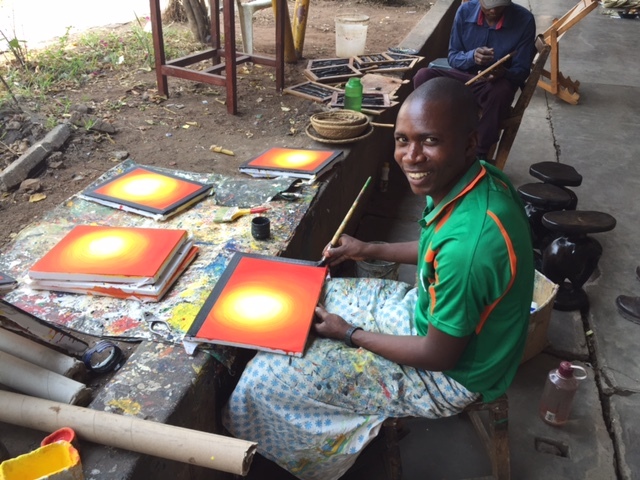 They also opened a bike shop, shipped old bicycles directly from America to Zambia and Botswana, trained locals to become bike mechanics, and then bought those refurbished bikes back. They are now used by schoolchildren who need to bike 7 kilometers each day to get to school and by farmers who need to get their goods to market. I often say to clients that you visit Africa the first time to see the wildlife, but you return often to be with the people. Those people need a helping hand. Visit Abercrombie & Kent for more info.